Short Guts is exact opposite of Long Guts. While in the long guts, In The Money (ITM) options are bought, in the Short Guts In The Money (ITM) options are sold. A lot of traders in India sell naked out of the money options. If you are one of them please read this article. I am sure it will learn some very important information on shorting options. Sell ITM (same number of) Put Options. It should be done on the same Stock or Index and of the same expiry. Options sold should be same distance from the current spot of Nifty or the stock. The further you go, the lesser you make because time value decreases, but the risk reduces. The closer you come, the more you make but the risk also increases. Note that in short guts you do not profit from the intrinsic value, you only profit from the time value and volatility in the option. Risk is Unlimited and Reward is Limited. See that the loss is unlimited on both sides. When to Trade Short Guts? If your view is that the stock is going to remain range-bound for the next few days because there is no major event happening in the near future and the Volatility is also expected to reduce. For example you traded Long Guts and because of the huge movement you got out in profit. Now the news is now out and there is not much to happen in the next few days, you can then trade the Short Guts. Remember that the Volatility will not get to normal in one or two trading sessions. It will take time to decrease. So ideally the Short Guts should be played when the news is out a couple of days back and markets have factored in the news and it looks like it will consolidate for the next few days. During this time the Volatility that has risen high due to the recent news, will also climb down slowly to settle at reasonable levels. This is perfect scenario to trade the Short Guts. When the stock is range bound Short Guts profit, because both the decreasing Volatility and passing time eats the premium of the sold options. The trader can buy back the options at a lower cost and exit in profits. Is Short Guts a Credit Spread? In technical terms, yes, because the trader gets a credit when he initiates this trade and one option or both options make money. Though I feel its not right to call this a credit spread. A real credit spread consists of a short position of higher delta and a long position of smaller delta. The long option saves the short from unlimited losses. 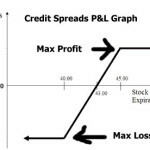 In the short guts the losses are unlimited, so please do not trade this thinking you are doing a credit spread. If you are not buying an option you are at risk of unlimited losses. Click here to read more about credit spreads. Nifty on February 10, 2015 closed at 8565. Let us sell 8800 Feb PE and 8300 Feb CE. Note that both are almost 250 points away from spot and both are in the money options (and NOT out of the money like most traders love to sell). Assuming someone sold the above options 1 lot each (or 25 shares of Nifty). Calculating Return in Investment (ROI): (1850/27000) * 100 = 6.85% in 16 days. Yes this is an excellent return if Nifty remains between 8800 and 8300, but this ROI is against an infinite loss. So trade with caution. Please understand that if you trade this, as soon as Nifty is anywhere near the sold strikes you will start losing sleep. Why? 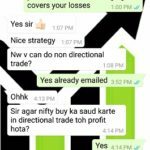 Because if Nifty keeps traveling in the same direction you will start losing money. However you still have sometime before you actually make a loss. Which means you only lose if Nifty is above 8874 or below 8226 on the expiry day, else you will take a profit anywhere between 0 to 74 points depending on where Nifty finishes. Warning: Do Not fall into the trap that there is zero to little chance that Nifty will be above 8874 or below 8226 on expiry day. It may happen or may not happen. The point is you do not know. But one thing is for certain that you may lose a lot of money in some or the other short gut trade some day. 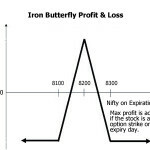 Note that in long guts the trader profits if any of the option i.e. the call or the put exceeds the break even. Here it has to remain between the break even points to profit. Important Tip: There is no need to wait till expiry if you are trading the Short Gut. Once you are making reasonable profits you should exit. Get that unlimited loss off the table. Do not get greedy to take it all. It may prove to be dangerous. Once a major news is out and Nifty or the stock had a big rally up or down, it is usual for the stock to consolidate for some time. At this time the Volatility is high, but it will try to go the mean in a few days time. This “few days time” has to be caught by you. As you can see there is a huge spike during the general elections. 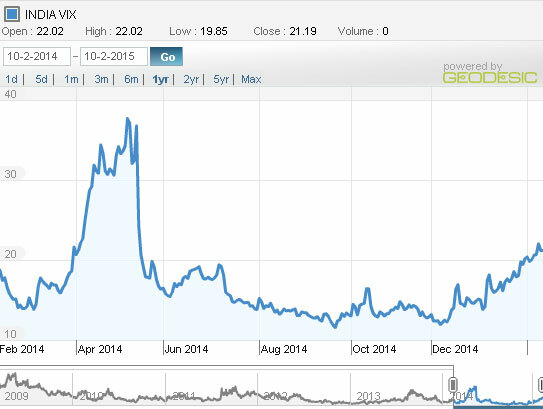 From the day results were out VIX went from a high of 39.3 on 12-May-2014 to 20.63 on 19-May-2014. So someone who sold a short gut around 12th May would be in good profits on 19th May. In such a short time Nifty also did not move much. It went from 6900 to 7300. This small movement cannot damage the short gut. The trader could have exited with a huge profit. 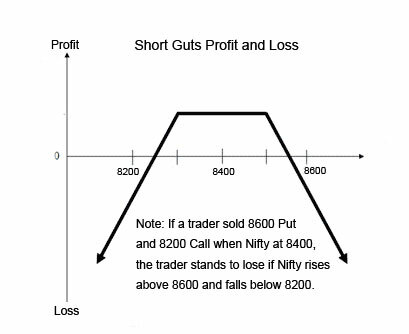 Short Guts is a trade where the trader has a range-bound view in a stock or index. It is played by selling In The Money Call and Put options. Both options should expire the same day. The number of options sold also should be same to make it a neutral trade. Also the distance from the spot price when sold also should be same. The trader benefits if there is not much movement and volatility also drops. Its better to take profits out once the volatility drops and not wait till expiry because you do not know where this stock will be on the expiry day. Just as long guts, the short guts also cannot be compounded as too much money is at unlimited risk. One bad trade can take away years of profits made in this trade. I hope you have learned some new things on shorting options. I am sure you must have shorted options at least once. Please let me know what difficulties you faced. I believe it is as good as short strangle. If there is any definite advantage or disadvantage of short gut vis-a-vis short strangle, please highlight. In fact the earning is of only due to decay of extrinsic value in both cases, due to time and volatility reduction. The time value is slightly more for OTM vs ITM, if both are equidistant from spot price, therefore in my opinion, short strangle are slightly better than short guts, with all other things almost identical. I would appreciate to have your comments on my analysis, particularly if you can add any value or substance. Yes you are right Short Strangle have only time value left and therefore they are priced higher. So it has some advantageous over the Short Guts. Selling options has more to do with traders psychology. For example when you sell in the money options, you get a healthy credit vs. selling out of the money options. Some people feel good about it – but that is it. Its more about how much comfortable you are as a trader selling in the money vs. out of the money. However when you are absolutely sure or are willing to take risk selling in the money options (naked not short guts/strangles) can make you very rich. 1) Sells 200 points OTM option of around 50 points. 2) Sells 300 points ITM options with at least 330 points. Nifty falls. Who makes more? So, as a trader we have to think before placing a trade. If it works great fine, else you should have a plan. BUT we should not jump from one strategy to another. That will not help. Master two or three and it should be enough. i won’t consider selling naked call, because if opposite happens, and resistance breaks, the itm fellow will have nightmares, if no stop loss mechanism is there. my idea was purely to compare strangle and guts, and wanted to know, how selling guts is better than strangle. it is not about eating the entire premium, it is simply the reward for the same amount of risk. carrying on with gut or strangle is very tricky, needs lot of adjustment, to remain viable. you might be aware of Karen of the â€œSuper Traderâ€ has gained some recent fame in the options world, as she generated outsized returns using a simple trading strategy, largely strangles, ref https://www.tastytrade.com/tt/karen-the-supertrader. further i have not read any of your article, and you may send links, if possible, so that i can check if there is some thing to learn for me, or sharing my thoughts, with your readers. Shai yes if you purely compare strangle and guts, it is almost always better to sell short strangles. Risk reward is better in strangles so most traders do sell strangles. I was just trying to say that if you can, to some extent, take risks – have stop loss in system or properly hedge – selling in the money options can make you extremely rich – BUT I WARN PEOPLE READING THIS – selling in the money options can be extremely risky. So please practice and trade with proper risk management. Yes I have read about Karen the “Super Trader”. Its amazing how she can manage selling naked options in an account with millions of dollars at risk. But please DO NOT imitate. She had done a $24k technical analysis course. She does it full time and has a team to discuss their strategies for their clients accounts. So please do not think she is “just selling strangles and making millions” – there is more to it that we do not know. One more thing – one silly mistake and her account can show negative returns. So be careful with selling naked strangles. Sir Every article by you is a perfect & full of knowledge. Keep writing ….:). Yes..I really benefited. For e.g. Common or say Tiny viny trader like me Used to buy OTM options because they are cheap….!!! Very true Tamil. OTMs are real clients for selling options for most option traders. They have better risk reward. This is just a post for those 5% “smart” people who love the risk associated with selling ITM options. But if you strictly compare guts and strangles – then short strangles are better than guts. For the time being, I would like to keep a safe distance from this ‘Short Gut Strategy’. But, for the sake of knowledge, it is welcome.